We are offering a limited exclusive arrangement for shoe retailers and manufacturers. Please contact us for details! The Footstep PRO provides medical professionals, including podiatrists, chiropractors, and orthopedic specialists, with detailed and accurate patient foot data. 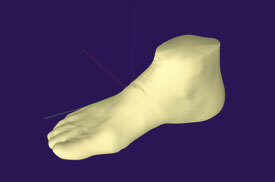 This allows for easier analysis of foot issues and more precise treatment procedures. When necessary, DreamGP America can use the data gathered to manufacture a custom-made orthotics.